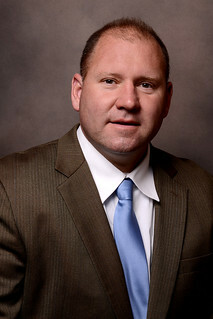 LITTLE ROCK -- Mike Kidd, director of the Center of Excellence for Poultry Science for the University of Arkansas System Division of Agriculture, has been named the 2014 Industry Leader of the Year by The Poultry Federation. The Poultry Federation, an organization covering Arkansas, Missouri and Oklahoma, honors outstanding individuals with this award for their contributions to the poultry and egg industry. The federation began honoring industry leaders in 1955, the year following its founding in 1954. Kidd was chosen because of his achievements in leading the department, supporting research, increasing both the number of students and their participation in poultry and egg industry, said Marvin Childers, president of The Poultry Federation and last year’s Industry Leader of the Year. “Dr. 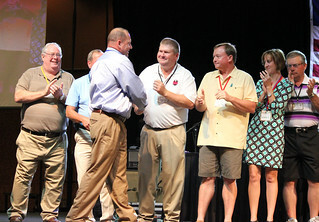 Kidd has revitalized the poultry science department at the University of Arkansas,” Childers said. Kidd was surprised when given the honor. He said he didn’t know he was even nominated. “It’s an absolute personal honor. I just can’t get over being honored like this,” said Mike Kidd, who is also head of the Poultry Science Department and a professor. “We are working hard to get more students trained and placed in key industry jobs that become great careers, as well as supporting our research and extension programs,” he said. The award was made June 13. For more information about poultry visit www.uaex.edu or contact your county extension office.